After breakfast, I took some time for a photo op in my bathrobe and slippers--a "before" for comparison. Finally the doorbell rang and my hair stylist was there. It was time for the magic to begin. Lindsay Mackey of Styles sectioned my hair and made dozens of pin-curls, then left them to set for several hours. I looked like an old lady, and the slippers and bathrobe didn't really help. 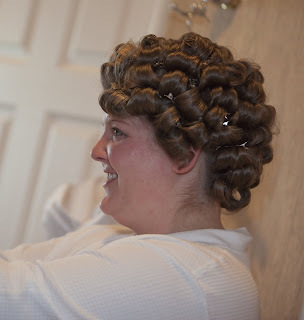 By the time Lindsay was done with my preliminary hair work, my bridesmaids, Mama and Sister Goodlaff, and our photographer, Niki Ross, had arrived, and all hell broke loose! I was glad that, for an hour or so, I had a little bit of time to myself on my wedding day. Looking back on it, the rest of the day was so crazy and it went by so fast, that to be alone first thing in the morning was so calming; I had time to get my thoughts together and really focus on enjoying the moment before everything really kicked in. I know not everyone is the same--some people prefer a constant flurry of activity--but for me, a little bit of alone time was just what I needed. That calm before the storm (and boy, what a storm it was), was probably one of the most cherished parts of my day. Did you have or are you planning to have a moment to yourself before all the hustle and bustle of wedding day begins? I don't think I will even have a second to myself on the day of or the day before..I hope I will even be able to sleep the night before! !